3.6 Torpedo Wall of Sound, only A Speaker Simulator? This manual describes the Torpedo Reload and provides instructions for its operation. It is highly recommended that you read this document before using the product. The contents of this manual have been thoroughly verified and it is believed, unless stated otherwise, to accurately describe the product at the time of shipment from the factory or download from our website. This document is the exclusive property of OROSYS SAS. In the interest of product development, OROSYS SAS reserves the right to change technical specifications, modify and/or cease production without prior notice. OROSYS SAS cannot be held responsible for any damage, accidental or otherwise, that results from an inappropriate use of the Torpedo Reload. Please refer to the safety instructions included in this manual. The reproduction of any part of this document is strictly forbidden without the written authorization of OROSYS SAS. All product names and trademarks are the property of their respective owners. Product names and trademarks found in this document were used during the development of the Torpedo Reload product but are in no way associated or affiliated with OROSYS SAS. The Torpedo Reload must never be used near a heat source, near a flame, in the rain, in damp areas, near any kinds of liquids. The Torpedo Reload is a loadbox. This term indicates that the Torpedo Reload is a load which can electrically replace the speaker cabinet while dissipating (transforming into heat) the power coming out of the amplifier. Within the Torpedo Reload is a Reactive load. A Reactive load simulates the complex impedance of a real speaker. Always connect the speaker out of your tube amplifier to an appropriate load (speaker cabinet or loadbox). The Torpedo Reload, once powered up, is such a load. Please note that you should always power up the Torpedo Reload before your amplifier. The maximum admissible power of the Torpedo Reload is 150W RMS, your amplifier shouldn't be set to play at a higher output power value. See this article if your amplifier is more powerful than 150W. • You may hear some noise coming out of your Torpedo Reload when playing, like there is a tiny speaker inside the box. This is perfectly normal and there is no reason to worry. The sound is produced when power goes through the coil of the reactive load embedded on the Torpedo Reload. The vibration is related to what power comes out of the amplifier connected to the Torpedo Reload and to the signal’s frequency content (notes played are heard). Your ampli- fier, specifically the output transformer of your amplifier, may also produce similar noise. Such noise is usually not heard, simply because it is normally obscured by the sound coming from the loudspeaker. • The Torpedo Reload has a built in fan, as there is quite a lot of power dissipated into heat inside the box. We selected a so called “silent fan”, but as it is running fast, it is never entirely silent. This said, you can consider that, in normal use (hearing your guitar through monitors, or headphones), you can barely hear the fan. Two notes Audio Engineering is proud to introduce the Torpedo Reload, the all-in-one analog interface for recording guitars and basses in the studio. This product has been developed through several years of technical development, with great attention paid to the needs of guitarists, bassists and sound technicians faced with the challenges posed by the miking of instrument amplifiers, on stage or in the studio. Our goal is to provide ease of use, reliability, versatility and above all, perfect audio quality. The Torpedo Reload is the interface everyone involved in modern guitar and bass recording situations needs. It was designed at first as the perfect interface between a guitar or bass amplifier and a sound card, so you can send the best signal possible to our Torpedo Wall of Sound plug-in, which embeds the Torpedo technology. A re-amplifying interface with a special function to perfectly adjust the level sent from the audio interface to the amplifier. Two notes creates the REPLAY™ and MATCH™ functions. Record your guitar using the DI, send the signal back to your amp using REPLAY™, drive your amplifier the way it should be driven and lower the level or simply make it silent with RE-ACT™, record the signal from the load box, and even use your own microphones and cabinets for a 3rd take - all simultaneously if needed! This product has been thoroughly tested in professional studio and stage environments and is the alternative many musicians have been waiting for to professionally capture the sounds of their amplified instruments. The Torpedo Reload coupled with Torpedo Wall of Sound will bring you the elusive sound of the greatest recording studios and producers, anytime, anywhere. Attenuators are usually known for the negative impact they have on your tone in cases of heavy attenuation, which ismainly due to the fact that the load presented to the amplifier will vary depending on the attenuation level. On the contrary, the Reactive-Active technology (RE-ACT™) presents your amplifier with a consistent speaker’s impedance no matter what level of attenuation you are at, thus preserving the specific character of your amplifier. With a choice of 4, 8, or 16 Ohms, your amplifier (up to 150W RMS, 200W peak) will actually see real speaker impedance, and your tone will remain constant throughout the continuous attenuation curve. The attenuated outputs and the loadbox output can be used at the same time, so you can simultaneously record the dry output from your amplifier’s speaker output and perform a traditional miking of your cabinet(s). You can plug or unplug the speaker cabinet anytime without worrying about its impedance with regards to the amplifier’s speaker output impedance, as the two are totally independent. Please note that a minimal attenuation is applied to the input power amplifier signal, whatever the position of the SPEAKER potentiometer. There is no bypass mode in the Torpedo Reload, meaning the sound will always be attenuated at the Torpedo Reload SPEAKER output. This attenuation is a function of several parameters, read more about that in the Specifications section. Plug your guitar or bass into the DI input and send that signal to your microphone preamplifier connected to your recorder. If the DI signal is too strong for your preamplifier, you can connect the DI output to a Line input, by using an XLR-XLR cable or XLR (female) to Jack 6.35mm (1/4”) TRS. At that stage what you want is clarity and Two notes preserves your guitar’s tone, as you will certainly want to re-inject it into your amp through the REPLAY™. This DI signal is also suitable to feed any kind of amplifier-modeling software that can be followed by the Torpedo Wall of Sound plug-in. Please note that here is no hardwired splitter function in the Torpedo Reload. To feed at the same time your DAW and an amplifier, you will need to send back the signal from the DAW using the REPLAY™ interface. Please read about the REPLAY™ function to discover this new and very effective way to record your instrument. The REPLAY™ output follows a low-impedance unbalanced design to ensure the best conditions when sending the signal to the amplifier. The ground lifts will allow you to solve any grounding issues that may come up when you are setting up the kind of complex wiring you can use with the Torpedo Reload. The most difficult part in re-amplification techniques is finding the output level on the DAW (Digital AudioWorkstation) that matches the level of your guitar when it is directly connected to the amplifier. This problem is now solved, thanks to the Torpedo Reload’s unique MATCH™ feature. This Two notes innovation is the solution to the problem of level adjustment when re-amplifying. If the level is too high your amplifier will tend to over-saturate, if the level is too weak the tone will lack dynamics and liveliness. MATCH™ compares the signal as it comes from the guitar (plugged to the DI input) with the signal that has been recorded (and which is sent to the REPLAY™ Line Input) so that what you send the amp is the ideal level only. Now you can be sure that the signal you send from the DAW is exactly what your guitar itself would be sending. You may even perform a MATCH™ with two different signals: if you have a previously recorded track, for instance, but do not have the guitar with you — plug a similar guitar into the DI In and match it to the signal! The Torpedo Reload comes with a Torpedo Wall of Sound plugin license. Torpedo Wall of Sound offers a “virtual” alternative to traditional miking to achieve a degree of realism never experienced previously with simulators. The musician simply plugs the Torpedo Reload in place of his/her cabinet, connecting the amplifier’s speaker output to it and without modifying any of his/her usual settings (or connected effect pedals as applicable). From there, the Torpedo Reload Loadbox output signal can be sent to any microphone preamplifier and that signal recorded thanks to your DAW on a track embedding the Torpedo Wall of Sound plugin. The Torpedo Reload comes with a library of 24 cabinets and 8 microphones among the most commonly used models in the world, which you can use in Wall of Sound. You can also upgrade and add many other cabinets through “La Boutique”, our online virtual cabinet store. The virtual miking is done by choosing one cabinet and one microphone, then fine-tuning the position of the microphone in front of the cabinet. Wall of Sound thus enables the user to assume the role of the sound engineer in a professional studio. The Torpedo Wall of Sound is a software plug-in you can embed in your recording program. The plugin should be used on tracks containing guitar or bass signal recorded from a preamplifier (guitar, bass, or any product with a line output) — or from a loadbox like the Torpedo Reload if you want to record the signal coming from the speaker output of your amp. Note: the evaluation version of Torpedo Wall of Sound is limited to 8 microphones and 2 cabinets, but the Torpedo Reload comes with a full license of Wall of Sound, offering 24 cabinets. Torpedo Wall of Sound can be used as a super-DI for keyboards. The tube-amp simulation feature, developed for guitarists and bassists, can also be a very interesting device to warm up the sound of a synthesizer, an organ, or a digital piano. Torpedo Wall of Sound offers you what every sound engineer wants: the possibility of carefully placing several microphones before the same cabinet, or of selecting several different cabinets and microphones and mixing them. You will discover the unlimited possibilities of multi miking, with up to 100 processing channels! Add as many microphone and cabinet configurations and mix them in the stereo field or keep them isolated on each channel, in real time. When recording guitars or basses, it is common to apply a few effects to shape the sound before it is sent to a PA or a recorder. In Torpedo Wall of Sound, you will find a 6-bands EQ filter (with guitar, bass and parametric modes), a 2-bands exciter, a studio compressor and a tweakable reverb. Torpedo Wall of Sound is capable of delivering the best guitar and bass tones by using the Torpedo technology, but you can also embed impulse responses that you have purchased or downloaded for free from 3rd-party developers, in WAV or AIFF formats. The Torpedo Reload offers a solution for silent and quality sound pick-up in many situations. The following illustrations show the most common situations the Torpedo Reload has been created for. All functions work at the same time, but we will first show a variety of the more simple setups. Please keep in mind that tube amplifiers must be connected to an appropriate load (cabinet or loadbox). Always plug the speaker output from your amp to the speaker input of the Torpedo Reload, and select the matching impedance. Always use a standard speaker cable between the amplifier speaker out and the Torpedo Reload SPKR IN. A speaker cable and an instrument cable may look similar. You may have to open the jack connector and see for yourself: the speaker cable is unshielded and carries the powerful signal through two insulated conductors, the instrument cable is shielded and has only one internal conductor. Using an instrument cable instead of a speaker cable can cause significant damage to your amplifier, requiring service by a technician. SIGNAL / CLIP: indicates the presence of a signal in either the DI, REPLAY™ or SPEAKER input (green color). The LED lights up red whenever that signal is too strong — if so, you need to lower the volume at the corresponding input. MATCH™: Increase the REPLAY™ potentiometer value if the up arrow lights up, and lower the value if the down arrow lights up. “OK” means that the level of the signal sent to the amplifier through the REPLAY™ Amp Out and that of the guitar’s signal in the DI input are at matching volumes. LOAD IMPEDANCE: shows the selected impedance on the Torpedo Reload. This value must match the value of your amplifier’s speaker output. Go to the back of the Torpedo Reload and select either 4, 8 or 16 Ohms. NB: The Torpedo Reload must be turned off when you select the SPEAKER input impedance. Your amplifier should not be powered on during the process. Overheating warning: this last indicator will light up if the temperature inside the Torpedo Reload is too high, which activates the security load. If so, please lower the volume on your amplifier or stop playing for some time, so the temperature decreases. Plug your guitar to the DI input and the DI output to your microphone preamplifier (or channel 1 on the mixer, or embedded preamplifier on your audio interface), and that preamplifier to Line channel input 1 on your audio interface. Activate Track 1 for recording & live monitoring, select channel 1 as an input. In any setup that involves a microphone preamplifier, it is important to set the correct gain on the preamplifier so the level of the recorded track is high enough. It is commonly recommended to set the gain on the preamplifier so the instrument’s signal will hit -16dB FS to -18dB FS (i.e., dB Full Scale, the value indicated on your sound card and sequencer input meter). If the DI output signal is too high for your microphone preamplifier input, and your preamplifier doesn't provide a PAD attenuator, consider using a line input instead. You may have to use an XLR Female Plug 3-pin to TRS 6.35mm (1/4“) Jack cable if your soundcard/mixer only provides Jack line input(s). 4.4.1 RE-ACT™, how does it work? Some attenuators are resistive, others are reactive, and most of them are passive. Passive means that the attenuator’s electronics does not require a power supply. Resistive means that the power out of your amplifier is tamed by the presence of one or several resistors on the signal path. The load impedance plays a huge role on the sound, and a resistive attenuator will make the tone somewhat darker, with losses in the high and low frequencies. Reactive means that reactive elements (transformers, coils and/or capacitors) are used instead of mere resistors. With this technology, the damping factor will decrease with the level of attenuation. Most of the time, a reactive attenuator means losses in character and fidelity, “muddy” sound and other unwanted effects. Another downside of passive resistive/reactive attenuator is the way the listening level is controlled, usually by some stepped potentiometer, which does not allow for precise volume setting, and limits you to a set of fixed attenuations. an ultra-low-distorsion, wideband, low-noise solid-state amplifier based on a widely used HiFi architecture. the speaker-output impedance of your amplifier is independent from the speaker impedance of the actual speaker cabinet you plug on the Torpedo Reload. This opens up a great many fun possibilities of cabinet mixing. Always match the value of the impedance on the Torpedo Reload (either 4, 8 or 16 Ohms) to your amplifier’s speaker-output impedance. The Torpedo Reload will normally get warm during use, so you must not put it in a closed box or obstruct the air vents. You can connect one or two cabinets to the Torpedo Reload, or no cabinet at all if you want to use the loadbox only (silent playing and recording). The impedance of the cabinets you may plug to your amp is independent from the impedance of that amplifier. You can very well use the 8-Ohm speaker output of your amp while having one 8-Ohm cabinet and another 16-Ohm cabinet plugged to the Torpedo Reload! Please refer to “Possible post-attenuation speaker combinations”, Part 7.2.3 for more information about cabinet matching. Connect your amplifier’s speaker out to the Torpedo Reload’s SPEAKER IN. Make sure the impedance selected on the Torpedo Reload matches the value at your amp’s output. Connect a cabinet to the lower SPEAKER OUT jack. Connect a second cabinet, if needed, to the higher SPEAKER OUT jack. The loadbox inside the Torpedo Reload remains active whether you have plugged a cabinet to it or not. We recommend using amplifiers with a maximum power rating of 150W RMS (200W peak). Basically, the loadbox turns your amplifier’s power into heat. If the temperature inside the Torpedo Reload is too high due to an excess of power, DO NOT WORRY: the active security system will put your amp on a safe security load, while the Torpedo Reload cools down. When you play your amplifier loud, you may hear some noise coming out of the Torpedo Reload. This is perfectly normal and there is no reason to worry. The sound is produced when power goes through the coil of the reactive load embedded in the Torpedo Reload. The vibration is related to what power comes out of the amplifier connected to the Torpedo Reload and to the signal’s frequency content (i.e., notes played are heard). Your amplifier may also produce similar noise, at the output transformer’s stage. Such noise is usually not heard, simply because it is normally covered by the sound coming from the loudspeaker. The sound may be a little different depending on whether a Torpedo Reload is placed between your amplifier and your cabinet or not. That is normal, as the internal speaker impedance of the Torpedo Reload will be slightly different from your cabinet’s. Most importantly, this slight difference is constant and does not depend on the attenuation level. The CONTOUR parameter will help you find the tone you are searching for, at low volume. This filter changes the attenuated speaker output, from more medium and vintage tones to more modern and midscooped tones. Basically, when playing at low volume, you may want to add that missing bass and treble, but we like to imagine a more creative way of using the CONTOUR, by modifying the tonal characteristics of your amplifier during a recording through traditional miking. CONTOUR has no effect on the DI, REPLAY™ or Loadbox outputs. Re-amplification techniques are commonly used nowadays, mainly to let the guitarist record a dry guitar in one place and time, and then have that dry recording sent to one or many amplifiers by a sound engineer who will take the time to find the right combination for the song. This way a guitar player who is equipped with a good quality DI and a DAW can take the time to quietly record at home without travelling to a studio, and eventually get a pro recording of a real amplifier. For more information about re-amping techniques, please read this Wikipedia article: http://en.wikipedia.org/wiki/Re-amp. With the Torpedo Reload, you can do both of those things: record the dry guitar with the DI, and then use the REPLAY™ to send that guitar track back to an amplifier. We will here present first a silent REPLAY™ (i.e., without actual cabinets plugged to the Torpedo Reload), and then the full setup for recording 3 different tracks at the same time. We shall assume here that the DI setup presented above (“3 Di recording”) is already operational. On track 1 of your sequencer you have recorded the sound sample of a dry guitar signal. Route Track 1 so its output is sent to your audio interface’s output 3, if 1 & 2 are used as Master output. It is important you use a different output from the Master one. This way you can hear the replayed track on the Master output, while sending the dry track to another output. If you only have 2 outputs, you can use output 1 to send track 1 and output 2 to hear the newly recorded replayed signal. Connect the interface’s output 3 into the REPLAY™ input. Connect the REPLAY™ output to your amplifier’s input. 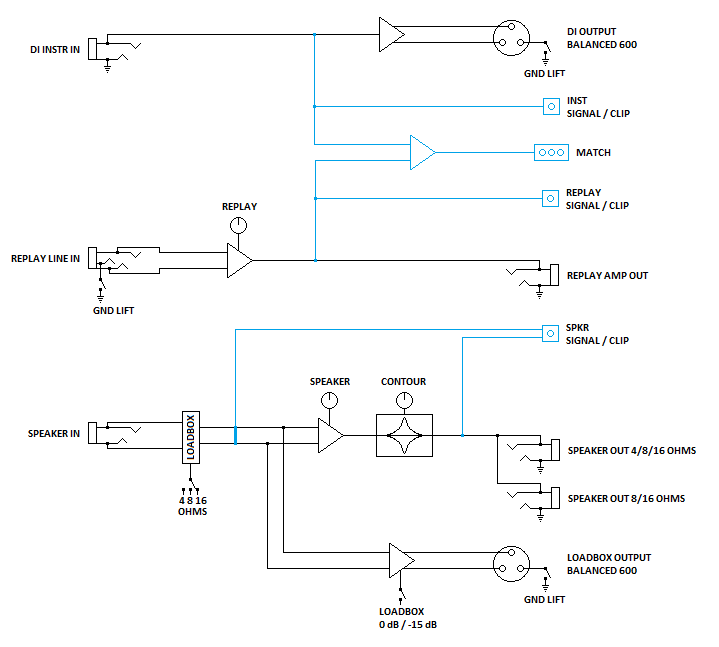 Connect your amplifier’s output to the Torpedo Reload’s speaker input. Connect the Torpedo Reload’s Loadbox to your second microphone preamplifier (or channel 2 of the mixer, preamp 2 on the audio interface). Connect the preamplifier to the Line channel input 2 on your audio interface. You can insert Torpedo Wall of Sound on the track so you can perform (non-destructive) miking while recording the dry signal of the amplifier. In the previous setup we decided to achieve a silent REPLAY™, but you can perform some traditional miking at the same time, with a controlled sound level thanks to the Torpedo Reload’s power attenuator. Connect a cabinet to the Torpedo Reload’s speaker output, set the appropriate volume for the cabinet using the SPEAKER potentiometer. Plug a microphone to your third preamplifier (channel 3 on the mixer, etc. ), place the microphone in front of the cabinet. Connect the preamplifier to the Line channel input 3 on your audio interface. Activate Track 3 for recording and eventually live monitoring to hear the result in the Master, select channel 3 as an input. When replaying with a high-gain amplifier, you may experience some unwanted noises, at a level higher than what you were used to with a guitar directly plugged into the amp. This is normal and mainly due to the amp’s huge level of gain, whereas our setup here is more complex and more sensitive to every source of noise in it. The different ground lifts we add to the Torpedo Reload will help, but may not be enough. We recommend having the different products (instrument, Torpedo Reload, computer, amplifier) as far as possible from one another, while keeping the unbalanced connections as short as possible. A noise gate in the effects loop of the amplifier always helps a lot with this kind of issue. The unique MATCH™ function will compare the signal sent from the guitar with the signal coming back from the audio interface. Use the REPLAY™ potentiometer to adjust the level of the track’s signal. We shall assume here that the silent REPLAY™ setup is operative. Activate the track-1 monitoring so the guitar’s dry sound will come back to the audio interface into the REPLAY™ input. That way the Torpedo Reload will be able to compare the guitar’s signal with the one sent by the audio interface. Play the guitar so you see a LED on the MATCH™ panel light up. Increase or decrease the value of the REPLAY™ potentiometer until the OK green led lights up, and your level-matching is done! MATCH™ works best if the latency of your digital audio interface is set to a value inferior to 20 milliseconds. You cannot use the MATCH™ function because your are replaying tracks that were recorded at a different time and place? Try to get some information about the guitar/bass that was used. Find a guitar with similar pickups (single coils, humbuckers, active…) and use MATCH™ as if this were the guitar used during the initial guitar recording, to find the REPLAY™ potentiometer’s correct value.